THOUGHTSKOTO Thoughtskoto : RESIDENTIAL LOT BY METROBANK FROM P50,000 to P300,000 NATIONWIDE! 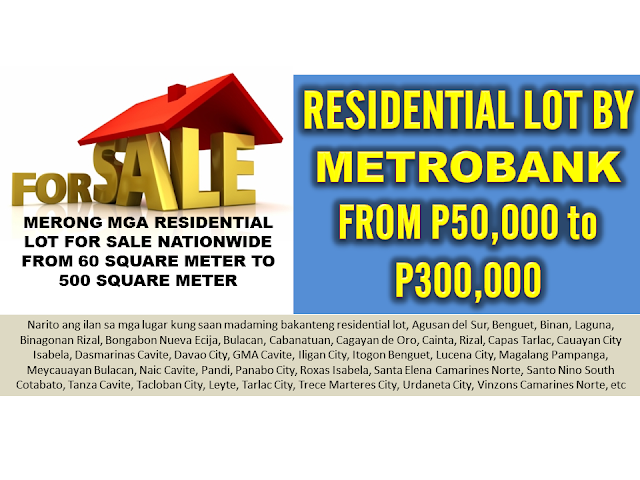 RESIDENTIAL LOT BY METROBANK FROM P50,000 to P300,000 NATIONWIDE! All sales on "AS-IS, WHERE-IS" and "NO RECOURSE" basis. No warranties. Prices NOT applicable to buybacks by former owners. Please contact Sales Division for buyback price. Properties & prices subject to change anytime & may be removed from the list for any reason Management deems appropriate. The list may reflect properties sold without the knowledge of AAMDG. For immediate correction, kindly advise AAMDG of such fact if identified. If multiple offers are received for the same property, a bidding shall be conducted the property shall be awarded to the highest bidder. Mere submission of an Offer to Buy does not confer "first option" or "first right" to the offeror. The deficiencies stated herein are not meant to be exhaustive, comprehensive or complete. Buyers are advised to conduct their own due diligence prior to making an offer. The Bank only shoulders Creditable Withholding Tax up to purchase price. Excess CWT and all other friction costs are for buyer's account. The list is an intellectual property of Metrobank. However, the Bank is not in any way liable if this shall be copied, reproduced, altered & /or tampered for any activities other than the purpose of marketing properties contained in it. These are pre-searched RESIDENTIAL VACANT LOT properties that are for sale by the Metrobank. You can contact them here call, send email and to inquire or you can visit the nearest Metrobank near you and inform them about your interest in the any of the following lot that are for sale. The following are some of the property listings that are for sale from the Metrobank website. You can find the detail of the certain lot through the TCT No. below. PLEASE REFRESH THE PAGE AS WE ARE UPDATING THE INFO FOR THE RESIDENTIAL LOT AND ALL THE OTHER DETAILS. THANK YOU. CONTACT THE FOLLOWING PERSONS BELOW IF YOU HAVE INQUIRIES regarding lot properties, bank loan, or inquiries about house and lot for sale.